In the world of education, it’s not uncommon for teachers to leave their roles in the classroom to pursue leadership positions in schools and districts. While school leaders typically assume responsibilities that differ from those in their former teaching roles, they often hold on to the same goal: to make a difference in the lives of children through education. The evening’s panel featured a group of Graduate School alumni who are leaders in the field: Laura Titkin-Sharick, GSE ‘12, Instructional Coach at the Riverside School for Makers and Artists; Jessica Diaz, GSE ‘08 and ‘09, Lower Elementary Academic Director at Girls Prep Bronx Charter School; Evan Jenkins, SFC ‘93 and GSE ‘18, Achievement Director of High School Math at KIPP New Jersey; and Asya Johnson, GSE ‘12, Principal of Longwood Prep Academy. The panel was moderated by Anthony Conelli, Chair of the Educational Leadership Department at the Bank Street Graduate School of Education, and Rachel Seher, Instructional Leader at City-As-School and Instructor of Research for Educational Change at the Bank Street Graduate School of Education. The event, which was attended by Bank Street graduate students, alumni, current teachers, and other members from the Bank Street community and beyond, commenced with a leading question: Why did you decide to move from being a teacher to becoming a school leader and what were the skills and knowledge you brought to that role? The panelists responded with stories from their classroom experiences and the “aha moment” that led them to take a leap of faith and replace teaching with leading. Other panelists described similar feelings they began to experience while teaching in the classroom. Johnson, who began her career as a special education teacher in Philadelphia, was candid about not feeling that classroom teaching was the right fit for her. But she noted that what did come from this experience was a newfound awareness of the many injustices in special education, and that this realization is what led her to want to become part of the decision-making process behind this very delicate area of the field. Johnson’s story set the stage for a deeper dive into the differences of working with children versus working with adults. 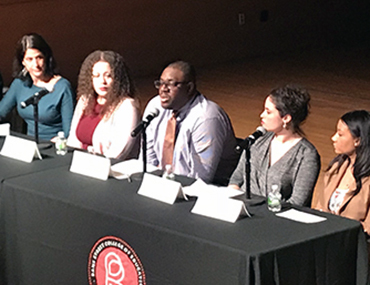 Many panelists described the satisfaction they receive from being able to work closely and connect with other adults as a means to affect the culture of their schools and classrooms and create meaningful environments for children that are primed for learning and growth. The conversation wrapped up with insights from the panelists into their experiences as Bank Street students. Diaz highlighted her involvement in the Principals Institute, namely how the cohort aspect of the program influenced her both as a graduate student and now in her work at Girls Prep Bronx Charter School. Following the discussion, which was hosted by Bank Street’s Offices of Career Services and Alumni Relations, the audience had the opportunity to ask the panelists some questions of their own. Bank Street program directors and faculty were available at the end of the evening for guests interested in learning more about leadership programs at the Graduate School.